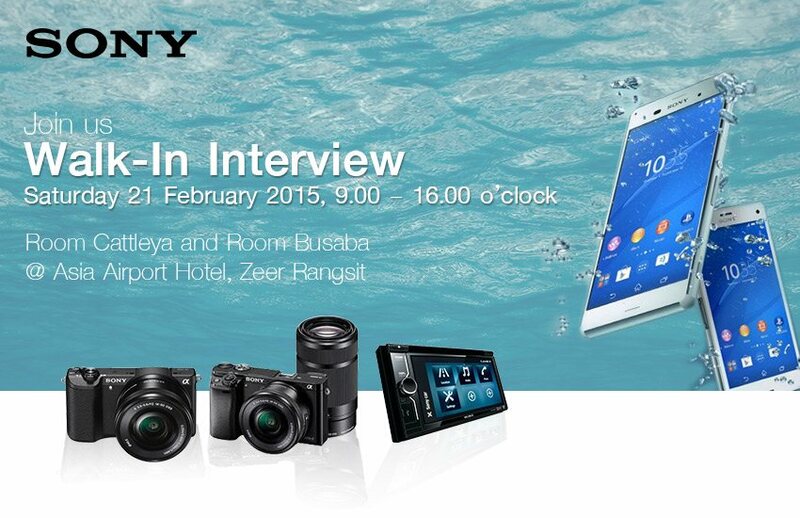 Sony Technology (Thailand) Co., Ltd is the manufacturing base located in Amata Nakorn Industrial Estate, Chonburi province producing world-leading products such as Digital Camera, Car Audio, and other key parts under the renowned “Sony” brand. Our brand’s vision is to use our unlimited passion for technology, content and services to deliver ground breaking new excitement and entertainment as only Sony can. Being section head of SMT Production. Control and monitor Surface Mount Technology Production KPI, Ensure SMT Product quality output. Manage SMT production to run smooth operation. 6-10 years’ experience in electronics manufacturing field. Education background in Electronic, Electrical or Industrial Engineer. Main responsibility concerns new line machine set up, machine down time improvement, development and machine problem solving and machine preventative maintenances. Knowledge of PLC Programming or other automation control. Familiar with relevant processes & quality system tools i.e. FMEA, GR&R, Cpk, SPC. Education background in Engineering of Electronic, Electrical, Telecommunication, Mechanical, Mechatronic, Industrial Engineer which related to job function. Provide interface between IT & Business unit to deliver high value fit for purpose business solutions. Control total system implementation task to meet schedule and budget. Computer programming skill & experience in Java servlet, Tomcat, Postgres. Education background in Computer Engineering, Computer Science, Information Technology Science or any field related to job function. At least 1 year experience in electronics manufacturing field is required. Production demand. Allocate plan both of in-house and outside to maximize internal capacity and meet with customer requirement. One position to control staff recruitment operation, recruitment activity to achieve target of manpower supply. One position to operate annual training plan and human development program. One position to control canteen, admin and cleaning operation. Key Responsibility: Material supply program management. Hot list handle & cross sale, Risk order management, Communication with planning. - Negotiation skill & Japanese or Chinese language skills preferable. Operate & manage factory standard system. Ensure all aspect of factory standard system. Manufacturing cost monitoring and analysis, Control company index, Analysis business and management report. Education background in costing accountancy. Bachelor Degree in any field except Business control officer position requires bachelor degree in costing accountancy. Flexible & Self-Adjusted including of enjoy to work under pressure. Skill in MS. Office is required. Energetic, Interpersonal Skill and Curiosity for Learning. Human Resources & Organization Development Dept.